All of the chain thrift stores, like Goodwill, Value Village and the Salvation Army, seem to be having sales of one kind or another this week. I am avoiding Value Village’s half price sale today, because it mostly applies to clothing, and we simply don’t need any more! I will be going to Goodwill’s half price sale this Friday, because it counts on dishes too! Until then, I am saving my money. So, today I am once again highlighting some of the pieces my mom has given me over the years. 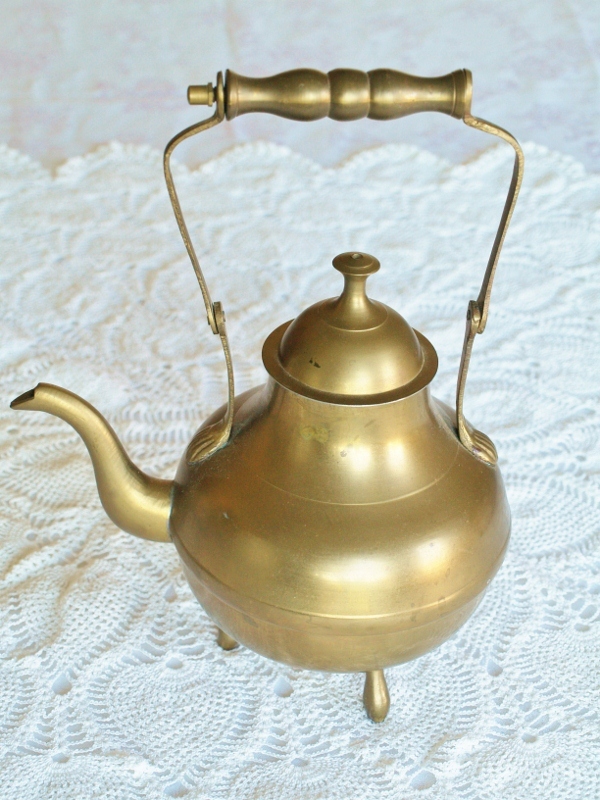 I have a number of brass items, including this teapot, above. By the way, some of these pieces could use a good polishing. But, if I waited until I got that done, I would never take the photos. 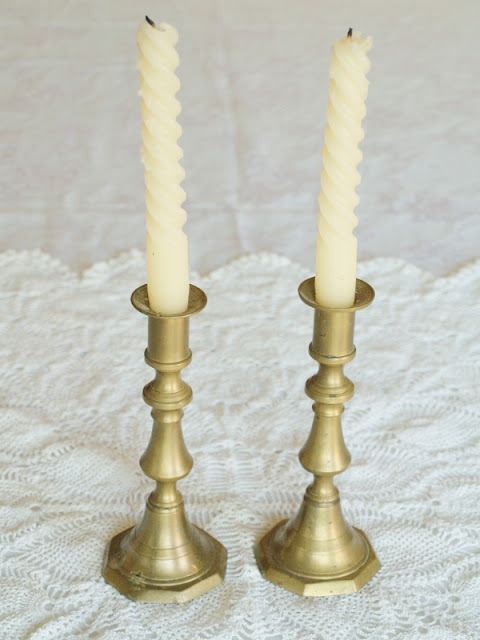 She also gave me these very cool candleholders. Here’s a closer look at the design. My daughter loves to play with the goblets. Today, they are being used to care for her toy puppy, Hollie. 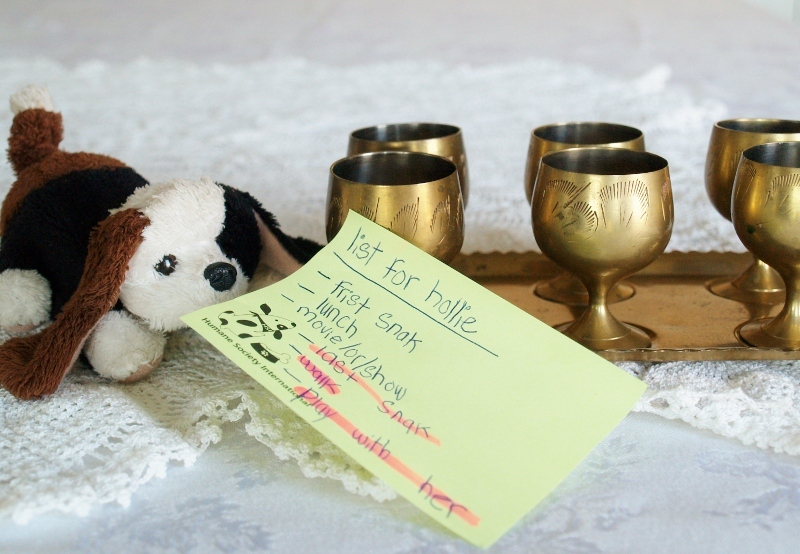 She left specific instructions regarding Hollie’s schedule for the day. The highlighted items are optional, she told me. This Warwick platter could possibly be the oldest item I have in my collection. It has been in my mother’s family for generations. I believe it came with them from Ireland, so that was a LONG time ago! It has obviously been broken and glued together (maybe more than once). 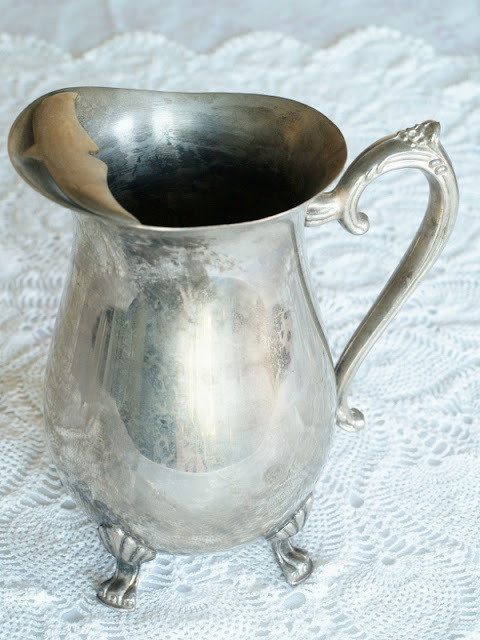 I just love this silverplate footed pitcher. What is your favourite family gem? 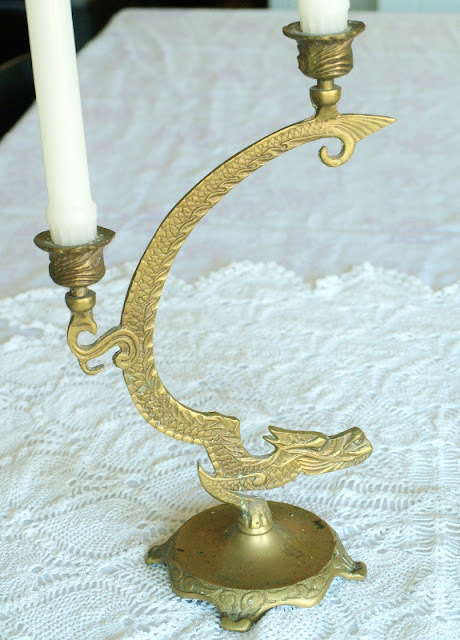 Love the Candleholders with the Dragons :) ,beautiful! The dragons are pretty cool, aren't they? Thanks for coming by again! Have a great week! Hi Tabetha, I have no willpower once I'm actually in the store, so it's best for me not to go! Beauties! It's funny because I went through a phase where I didn't like brass but now I love it all over again, especially when it's matte and not super shiny like your lovely pieces (another excuse not to polish!). I don't have any family treasure (sob!) Wish I did, it's so nice to have things which remind you of past family members. It is cute, isn't it? She checks on what I actually did when she comes home from school too! 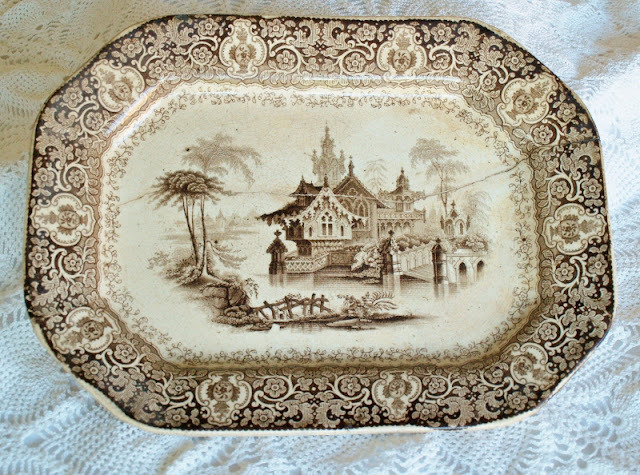 You have some prescious treasures...the warwick platter is gorgeous! 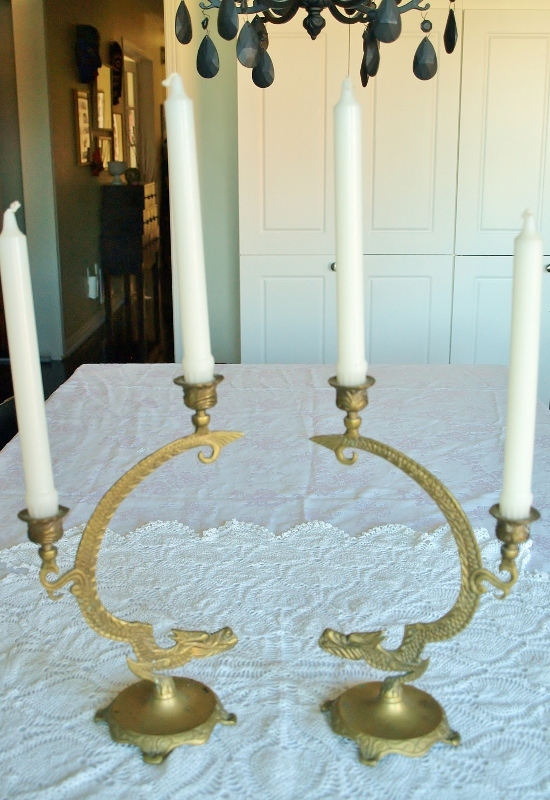 I love when you share your parents treasures, I can relate to how special the pieces are. They're all beautiful (those dragons -wow)! I don't know if I can choose a favorite family treasure, I've been blessed with a lot from them. Probably all of the photos my father took between the 1930's and 1950's while traveling overseas. What a great group of treasures! I love that the platter has been passed down through generations, cracks and all! Thanks Ruthie. It is indeed very special to think of all the people who cared for the platter and passed it on. I must say again, you definitely have a knack for home decor! Have you ever thought about pursuing a job that was associated with that (ie interior designer? )(or do you already work as one? :o). Anyhoo, your house must be fabulous! You could wing up a whole new theme every month! I really like the dragon candle sticks and the little feet on the teapot in the first photo. Thanks for sharing at Cap Creations. Oh, you have some great treasures here~! 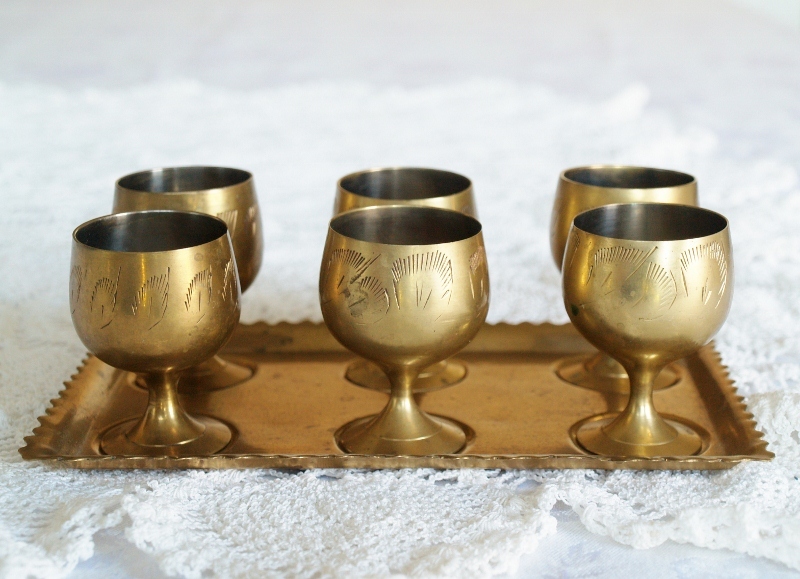 I like to have pretty brass items around especially during the winter because it just feels like it warms up a room! Thank you for sharing this with us at TTF. I hope you have a fantastic day!